WARNING Do not use the cruise control under the following conditions: Using the cruise control under the following conditions is dangerous and could result in loss of vehicle control. WARNING Always turn off the cruise control system when it is not in use: Leaving the cruise control system in an activation-ready state while the cruise control is not in use is dangerous as the cruise control could unexpectedly activate if the activation button is accidentally pressed, and result in loss of vehicle control and an accident. NOTE When the ignition is switched OFF, the system status before it was turned off is maintained. For example, if the ignition is switched OFF with the cruise control system operable, the system will be operable when the ignition is switched ON the next time. Activate the cruise control system by pressing the ON switch. The cruise main indicator light (Amber) illuminates. 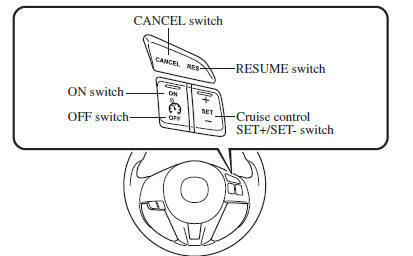 Set the cruise control by pressing the SET + or SET - switch at the desired speed. The cruise control is set at the moment the SET + or SET - switch is pressed. Release the accelerator pedal simultaneously. The cruise set indicator light (Green) illuminates. (Automatic transaxle) The selector lever is in the P or N position. (Manual transaxle) The shift lever is in the neutral position. Release the SET + or SET - switch at the desired speed, otherwise the speed will continue increasing while the SET + switch is pressed and held, and continue decreasing while the SET - switch is pressed and held (except when the accelerator pedal is depressed). Cruise control may cancel at about 15 km/h (9 mph) below the preset speed, such as when climbing a long, steep grade. Press the SET + switch and hold it. Your vehicle will accelerate. Release the switch at the speed you want. Press the SET - switch and release it immediately to adjust the preset speed. Depress the accelerator pedal to accelerate to the desired speed. Press the SET + or SET - switch and release it immediately. NOTE Accelerate if you want to speed up temporarily when the cruise control is on. Greater speed will not interfere with or change the set speed. Take your foot off the accelerator to return to the set speed. Press the SET - switch and hold it. The vehicle will gradually slow. Multiple operations will decrease the preset speed according to the number of times it is operated. (Manual transaxle) Depress the clutch pedal. If any of the following conditions occur, the cruise control system is temporarily canceled. When the cruise control system is temporarily canceled by even one of the applicable cancel conditions, the speed cannot be re-set. (Automatic transaxle) The cruise control cannot be cancelled while driving in manual mode (selector lever shifted from D to M position). Therefore, engine braking will not be applied even if the transaxle is shifted down to a lower gear. If deceleration is required, lower the set speed or depress the brake pedal.